We arose early again on Wednesday, but had a more relaxed morning before heading out for the day. The only remaining scheduled item wasn’t until early afternoon, about an hour’s drive away, but we figured we could make some stops along the way. 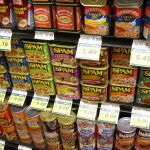 The first stop was a supermarket, just so I could see their SPAM® selection. 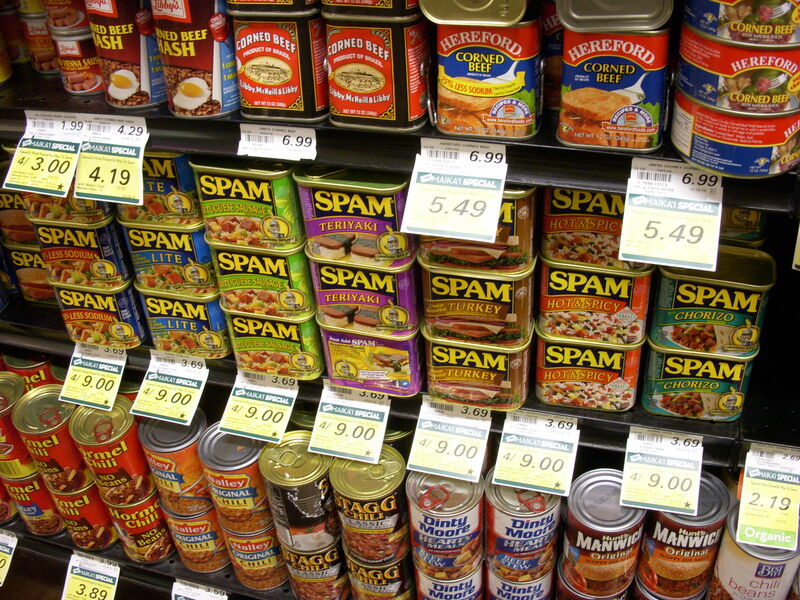 As you may or may not be aware, Spam is extremely popular in Hawaii. While your average mainland store will carry Spam Classic and maybe Spam Lite, most stores in Hawaii have at least a half-dozen varieties… this particular store had eight. In case you’re wondering, 15 varieties exist, plus Spam Spread (yeah… even I’m not touching the spread). We did eventually return home with a can of Spam Chorizo, though we haven’t yet sampled it. Continuing on, we drove into Wiamea, stopping at a small clutch of artsy stores. We did a bit of souvenir and gift shopping, stopped for a quick snack at a local coffee shop, then continued on our way. Coming off Mamalahoa Highway, we followed our GPS on some winding roads about 1250 feet up Mauna Kea, which gave us some stunning views of the ocean. 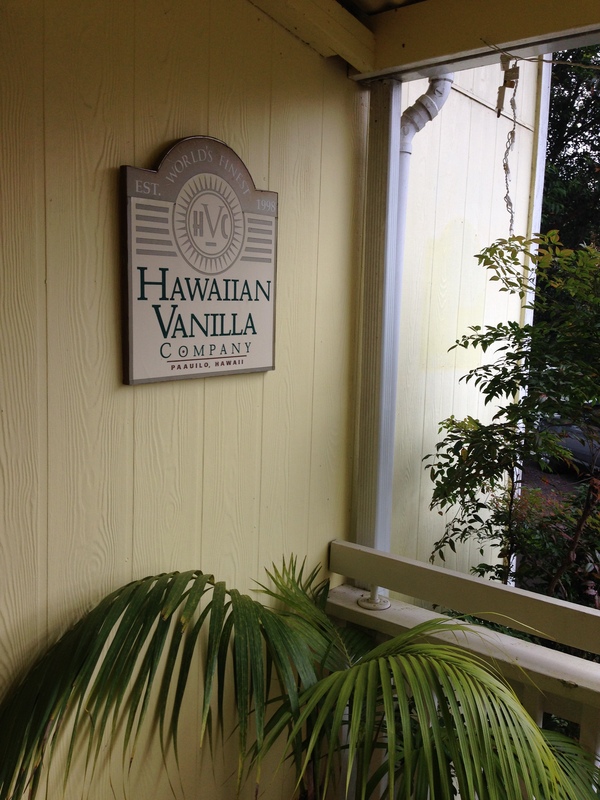 Our destination was the Hawaiian Vanilla Company, where we’d booked the Vanilla Experience Luncheon. The lunch—indeed, the experience overall—did not disappoint in the least. We were greeted upon entry by owner Jim Reddekopp, handed a beverage (we both opted for the “Jimmy Boy,” half vanilla iced tea, half vanilla lemonade), and shortly escorted to a back room where we joined others on the tour (including a couple and their daughter from Downingtown—small world). The lunch started with a short speech from Jim as he cooked Vanilla Garam Masala Shrimp as a little appetizer. Delicious! We then moved on to lunch (along with another Jimmy Boy), which comprised a vanilla citrus bourbon marinated chicken sandwich with vanilla caramelized onions on a vanilla sweet bread bun, served with a salad topped with vanilla honey glazed pecans and feta with a vanilla raspberry balsamic dressing, and oven roasted potatoes with a vanilla southwest rub. Vanilla barbecue sauce and a vanilla mango chutney aioli were available for the sandwich; after some sampling, I ended up putting the barbecue sauce on the chicken and dipping the potatoes in the aioli (which turned out to be amazing). Admittedly not the best chicken sandwich I’ve had (it needed something more—cheese, maybe? ), but overall a great meal. And despite the amount of times I’ve typed “vanilla” in this paragraph, it was a wonderful background to the meal but not overpowering in the slightest. 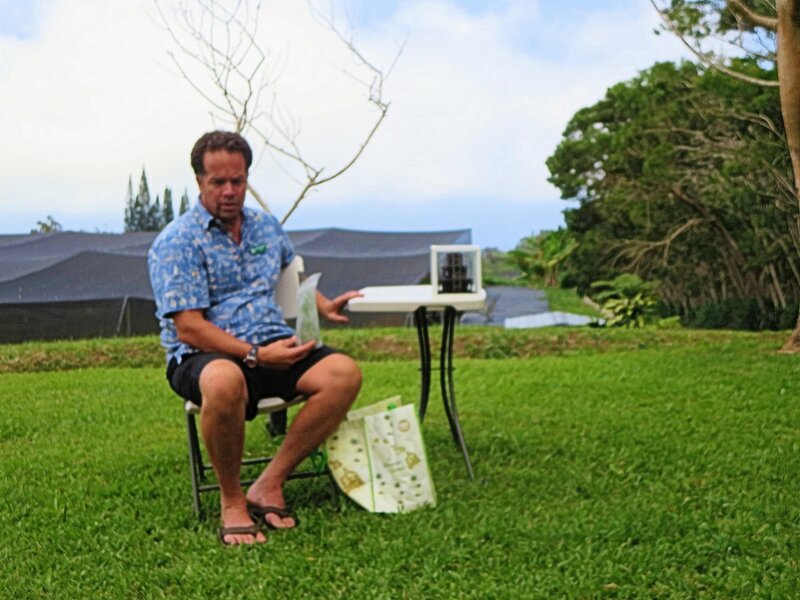 From there, we took a short walk to where the vanilla is grown, and everyone sat down for a short but interesting presentation from Jim, about how he got started and the vanilla growing process. 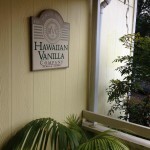 Then it was off to see the vanilla plants (probably not the most interesting time of year for that), and back to our room for a short video presentation and vanilla ice cream with vanilla lilikoi curd and a small bit of cold brew vanilla coffee to finish. While we certainly figured this would be an enjoyable stop, it really blew us away. We picked up a few products from their store (various vanilla teas and a vanilla extract kit), waited out some passing showers, and headed back west. 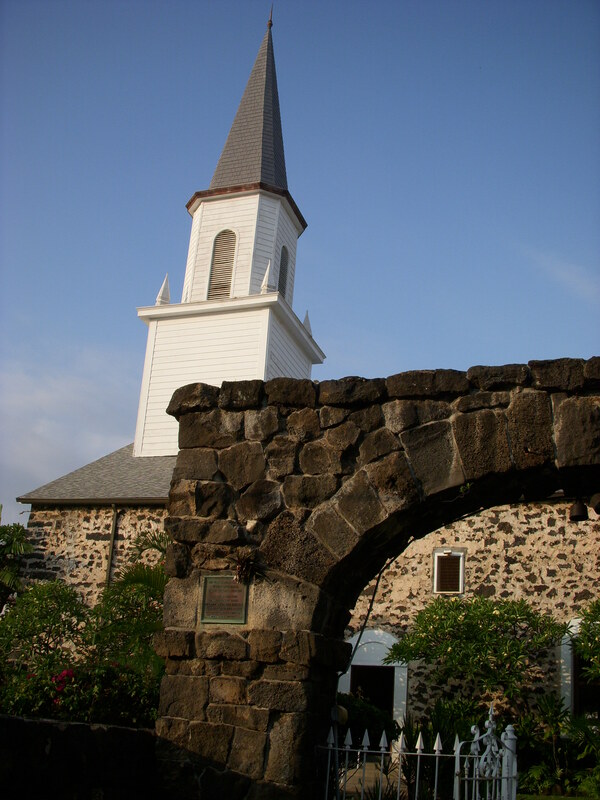 After a quick stop back at the resort, we headed south of the airport for the first time, into Kailua-Kona, a larger town about a half hour or so from where we were staying, clearly a popular location. 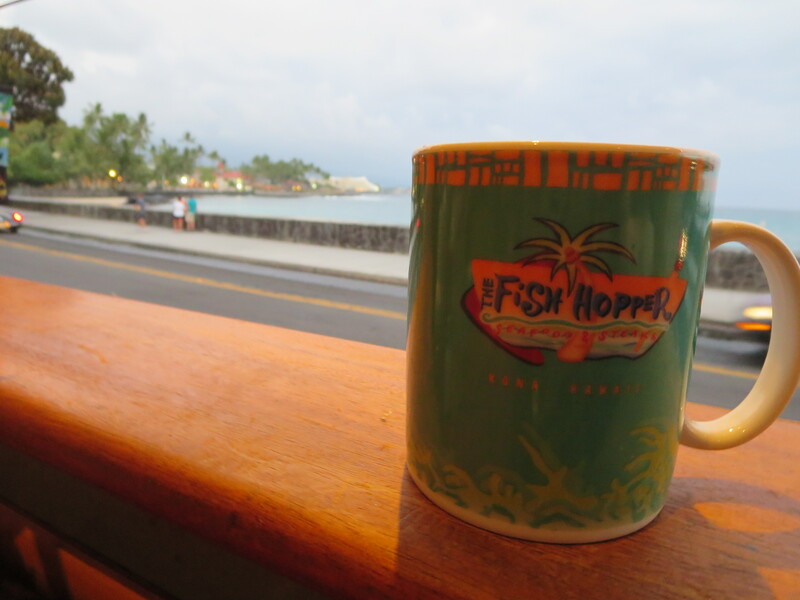 Our first stop was for a pre-dinner drink at Kona Brewing Company. Sadly, we’d driven past Big Island Brewhaus earlier, which probably would’ve been the better option. Instead, we split a flight at Kona, and it was… beer. 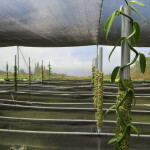 Big Island seems to get a bit more creative with their recipes, while Kona plays it safe and a bit boring. That done, we made a dinner reservation via Open Table, drove to the restaurant, then immediately canceled when we realized it was attached to a hotel. It felt as if we might as well dine at Applebee’s if we were going to go to a hotel-attached restaurant. Instead, we drove down the town’s main street by the ocean, saw a bunch of restaurants, and found somewhere to park. 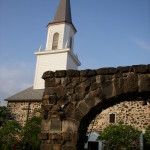 We were also able to walk around the town a bit, finding Hawaii’s oldest church, and doing some more souvenir/gift shopping. 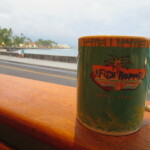 Dinner was at The Fish Hopper, which gave us a lovely view of the ocean as we ate. Gina and I shared an ahi poke appetizer and a fish special, then each got our own dessert (which was huge). The food was good, though nothing all that outstanding. I’ll say this much: it wasn’t worth what it cost. But, this was all about the location and the company, so it was indeed a great meal as we watched the sun set over the ocean—a delightful view that the hotel restaurant would not have provided. 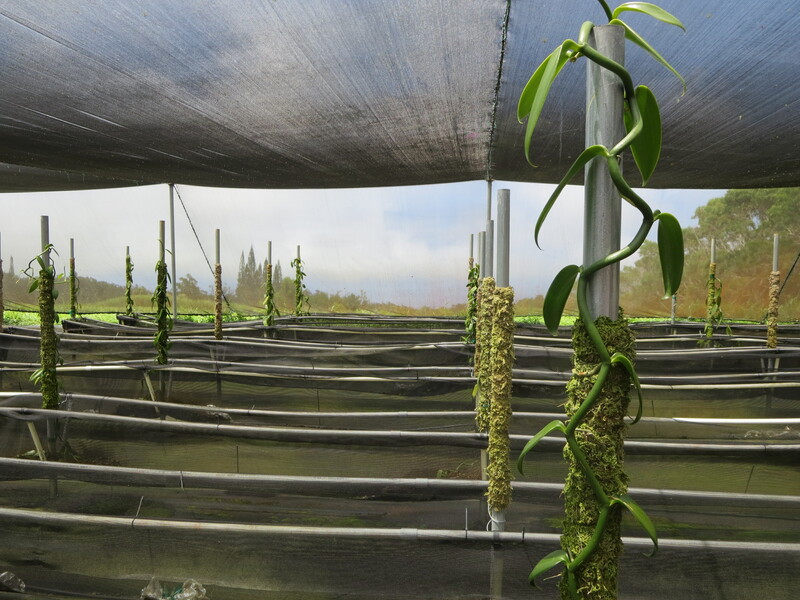 Our planned activities were complete, but we still had a full day to go before leaving Hawaii… so, more to come!